The all-new 2.5-litre petrol engine looks great on paper, but can it deliver in the real world? Ever since the Toyota Camry was sold with a hybrid option sitting on top of the range, there still were two non-electrified petrol options to choose from. The four-cylinder engines comprised of 167hp 2.0-litre and 181hp 2.5-litre aimed at cost-conscious and performance-oriented buyers accordingly. For the all-new Camry launched recently, the three motor lineup remains. But while the smallest engine has been carried over, the larger of the two is a new development (to additionally harness the latest hybrid version we tested last month). Called A25A-FKS and producing 209hp, the new engine block focuses on a longer stroke length which, in theory, helps for more usable torque at low engine speeds. The old one, known as 2AR-FE, made 181hp and doesn’t feature the more advanced variable valve-timing and higher 13.0 (up from 12.8) compression ratio of its successor. And thanks to an eight-speed torque-converter auto replacing the six-speeder, the new 2.5 is far more efficient than ever. With a 15.6kpl rating, it’s more frugal than the 173hp 2.5-litre Teana (13.3kpl) and 174hp (12.2kpl). And because the Camry 2.5 is the only one capable of spewing out less than 150g/km of CO2 for lower excise tax, it’s cheapest at 1.589 million baht. In its own game and over its competition, the new 2.5 sounds like a winner on paper with its class-leading power, economy, emissions and price. With maximum power being produced at 6,600rpm, the new 2.5 packs a decent punch when you exploit it on an open road. For outright performance, it’s the deal. And thanks to a relaxed top gear, the engine speed can be kept just under 2,000rpm when cruising on the highway thus contributing to that 15kpl-plus rating. Since the all-new Camry was designed with sportiness in mind, this could arguably be the right approach in styling terms. 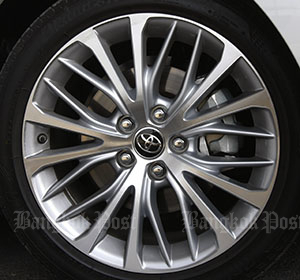 Toyota is hoping to make the 2.5 the sportiest Camry available at the moment explaining the 18-inch wheels and low-profile rubbers it has; the HV hybrid gets 17-inchers with slightly thicker tyre sidewalls. And the ride hasn’t been necessarily compromised even though the HV’s combination is better still. It’s the handling that separates the Camry from its two rivals. The Toyota doesn’t only steer sharper but feels more engaging to drive. The same goes for the packaging whereby the Camry’s compact exterior dimensions still manage to yield competitive levels of cabin room and comfort. While the engine manages to feel lively when pushed to high revs, it feels quite breathless at city speeds. Which isn’t surprising because this is a non-turbo unit with too much focus being put on top of the performance curve. Engine response is also quite lethargic for a naturally aspirated unit. OK, the 2.5 in G trim may not have rear side airbags, air purifier, reclining rear seats and full set of driver-assist tech as in the range-topping HV (asking for a higher 210k), but its features are still sufficient to compete with its two traditional opponents (not to mention it being cheaper, as well). 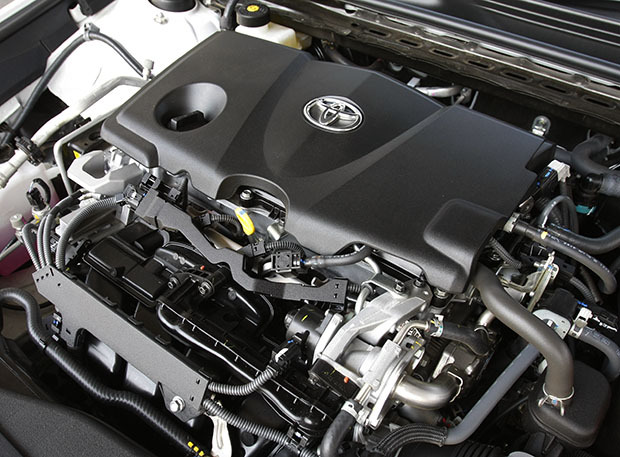 Conceptually speaking, the 2.5 G ought to be the Camry for buyers needing some sporty driving performance. But powerful it may be, it still needs more tractable power for real-world driving which is something that isn’t lacking in either the Accord or Teana equivalent. In fact, the HV in the Camry stable feels equally as powerful but more lively and responsive than the 2.5 G in practically all driving conditions. Better, HV is far more economical on fuel. Compared to the similarly specified HV, the 2.5 G costs just 50k less which seems quite pointless for a 1.5 million baht car. True, the 2.5 may cater to those who still have doubts about hybrid technology. But then it’s time for this mindset to change because the HV is by far the better choice, even from a performance perspective. Sitting at the bottom of the range is the usual 2.0-litre model whose 167hp engine and six-speed automatic transmission have been carried over from the previous-gen Camry. Because the 2.5 is a new development, it yields exactly the same fuel economy and CO2 figures as in the smaller 2.0. Thus, both face the same excise tax of 20% due to their E85 gasohol compatibility and sub-150g/km of CO2. Although the 2.0 can be basically considered redundant in engineering terms, it isn’t exactly so in the showroom. 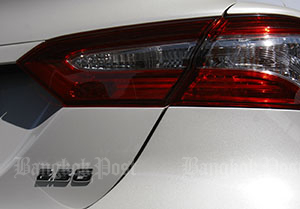 Spec on spec, the 1.445 million baht 2.0 costs 144k less than the 2.5 which could matter to cost-sensitive buyers or company cars with a cut-out price level at 1.5 million baht. While the recently updated Teana from Nissan still persists with 2.0- or 2.5-litre petrol offering, it’s interesting to see whether the all-new Accord from Honda will forego the 2.0- and 2.4-litre options early next year. Apart from the 2.0-litre petrol-electric (already doing a decent job in the current generation), word is out that a petrol-turbo is on the cards for people who don’t want a hybrid-powered Accord. By using the 173hp 1.5-litre petrol-turbo from the today’s Civic, the Accord could achieve less than 150g/km of CO2. More crucial for users, the presence of the turbo helps for real-world tractability, which is something usually lacking in naturally aspirated engines.